Hillary Clinton admitted it was maybe a little too much to take in during the moment. “I’m going to take a moment later tonight and in the days ahead to fully appreciate the history we made here,” Clinton said. 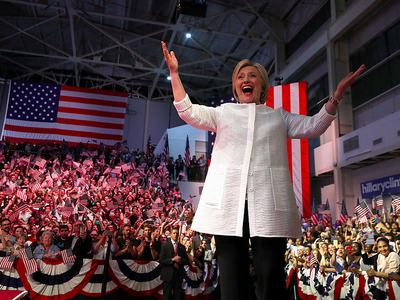 She was speaking to supporters in Brooklyn, where the newly presumptive Democratic presidential nominee relished the historic nature of her candidacy: Becoming the first woman to lead a major party’s presidential ticket. 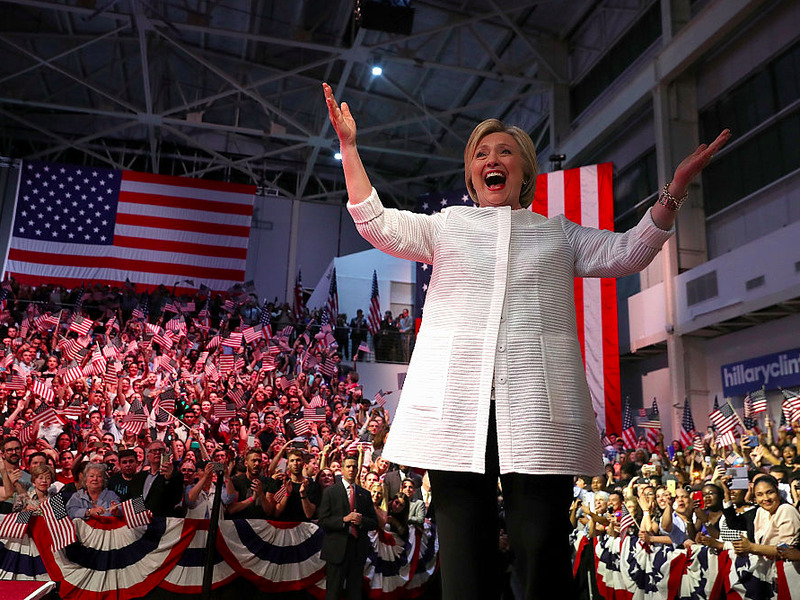 “Thanks to you, we’ve reached a milestone — the first time in our nation’s history that a woman will be a major party’s nominee for president of the United States,” Clinton said, as the audience erupted in cheers. Clinton has not dwelt too heavily on the opportunity for her to make history. But the former secretary of state embraced the theme Tuesday. “We all owe so much to those who came before, and tonight belongs to all of you,” Clinton said. Clinton’s speech Tuesday night came as a welcome opportunity for her backers to strike a positive note in an exceedingly negative campaign. Some Democrats, including top advisers to Clinton’s campaign, complained that the historic nature of the former secretary of state’s candidacy wasn’t often mentioned in the coverage of her campaign. New York City Council Speaker Melissa Mark-Viverito admitted that part of her didn’t expect the possibility of a female president in her lifetime. “As a woman I’m very, very excited. This isn’t something that I thought I would see in my lifetime to a certain extent,” Viverito told reporters before Clinton’s speech in Brooklyn. Many of Clinton’s supporters were quick to raise Clinton’s history-making nomination. A woman named Beth, who stood with a friend who had driven up from Georgia to see Clinton speak, ruminated on the night’s significance. “It’s amazing, and long overdue,” she told Business Insider. Still, while Clinton was ready to tie the bow on her primary campaign, the former secretary of state’s Democratic rival didn’t have the same plans. Despite impending massive staff layoffs and reports of campaign discord, Sen. Bernie Sanders vowed to keep his campaign alive until the delegates officially voted at the Democratic National Convention next month in Philadelphia. “Next Tuesday we continue the fight in the last primary in Washington, DC,” Sanders said. Still, to many close to the Clinton campaign, Sanders’ eventual concession is a foregone conclusion. While she served as an attack dog for Clinton during the New York primary, Mark-Viverito brushed aside concerns that Sanders supporters would continue to oppose Clinton. The campaign’s staffing decisions signalled a moment of calm. Some Clinton staff members that usually hunker down in the campaign’s Brooklyn office on primary and caucus days had beers in hand. They roamed the press area, chatting casually with reporters and supporters who were taking in the speech from excess space on the press risers.